1981. 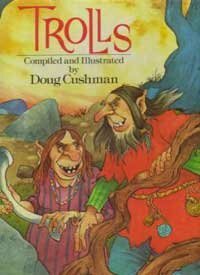 Large picture book about Troll tales. Contents: (Pa engelsk) The Troll, The Lumberjack and the Cheese, Troll Sat Alone, The Troll's Invitation, As I Was Going Up and Down, The Terrible Troll, and The Hulder Maiden. About Doug Chushman (Author) : Doug Chushman is a published author. A published credit of Doug Chushman is Trolls.